Combine all the classic flavors of summer into one simple dish! 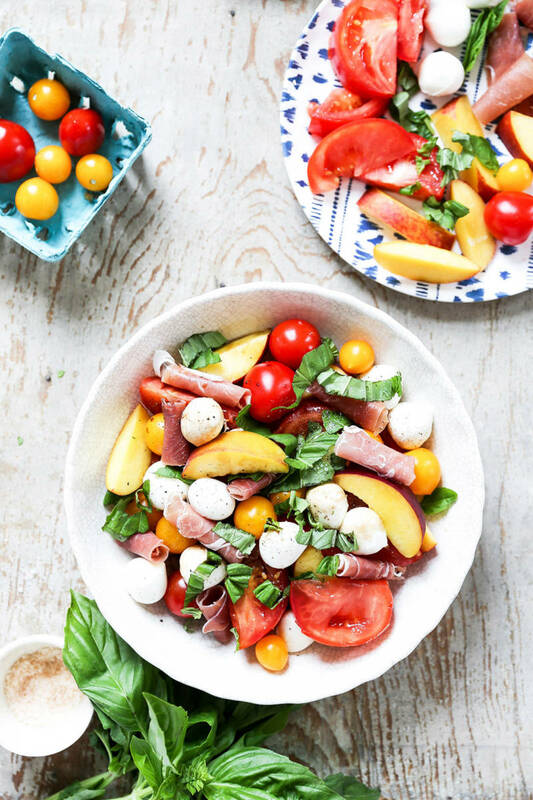 This delicious Peach Caprese Salad from Elizabeth Harris of Floating Kitchen is the perfect side to all your late-summer meals. I could seriously live on caprese salad all summer long! They are hands-down my favorite salads to make and enjoy when sun-ripened tomatoes are at their peak. Even in the simple of combination of tomatoes, basil, and mozzarella transports me to a small, outdoor patio in Italy. Some days, though, I want to take my caprese salads to the next level. When those moments strike, I have a few easy tricks up my sleeve that help me do that. My favorite? Adding fresh fruit like Harry & David Oregold Peaches. 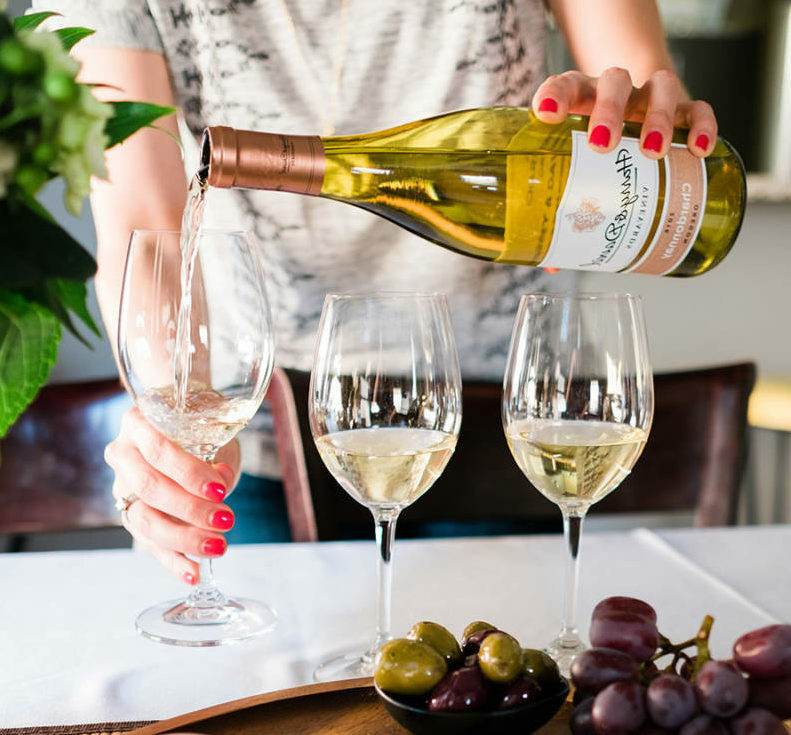 You’re definitely going to want to give these simple additions a try! First, I’ll use a mix of tomatoes because I just love the contrast of colors and shapes between a few big wedges of heirloom tomatoes and a little handful of round cherry tomatoes. Second, I add in some rolled prosciutto for an extra salty punch. This really helps the salad feel like a full meal! And third, I toss in some juicy, perfectly-ripe peaches. 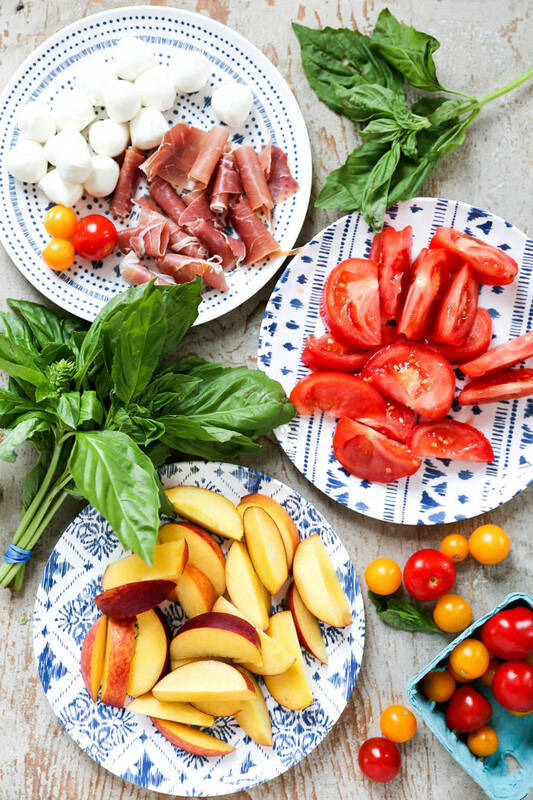 The sweetness from the peaches mingles perfectly with both the acid from the tomatoes and balsamic vinegar, as well as the salt from the prosciutto and mozzarella cheese. It’s a dreamy, well-balanced combination that takes advantage of all the best flavors of summer! Since there are already so many wonderful flavors going on in this Peach Caprese Salad with Prosciutto, I keep the seasoning and dressing to a minimum. Feel free to adjust it to suit your taste preferences by adding more or balsamic to the recipe. In a large bowl, gently toss together the sliced peaches, sliced tomatoes, cherry tomatoes and mozzarella cheese while you drizzle in the olive oil and balsamic vinegar and sprinkle in the salt and black pepper. Fold in the prosciutto and basil leaves. Divide the salad between serving plates and enjoy immediately. Check out this other unique peach salad recipe that we love: Peach Panzanella Salad.